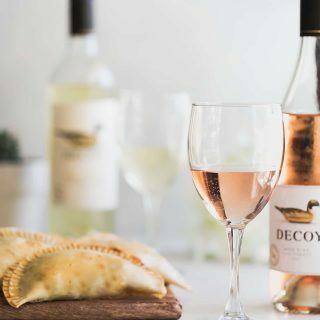 Two delicious types of baked savory sweet empanadas (dates, bacon & brie and mushroom, caramelized onions, & goat cheese) are the perfect pairing for rosé and white wine! A while ago, I went to this local spot here in Miami named Fufi’s Restaurant where they serve authentic Argentinean empanadas. SO GOOD. The decor inside is so intimate and cozy. Romantic lighting, wood everything and just the best overall ambiance with the friendliest service. The empanadas were also unique and flavorful. Not your typical beef and chicken. Although they did have those flavors too, along with pizza and vegan tacos. But I was more impressed by the sweet savory empanadas because they were just SO GOOD. You know I love me some sweet & salty! After my visit, I knew immediately that I wanted to try to recreate a few of those flavors in my own kitchen. Sure, some may say that empanadas are more like snacks or appetizers than an actual meal. To me though, I could totally eat empanadas for dinner with a glass of wine! 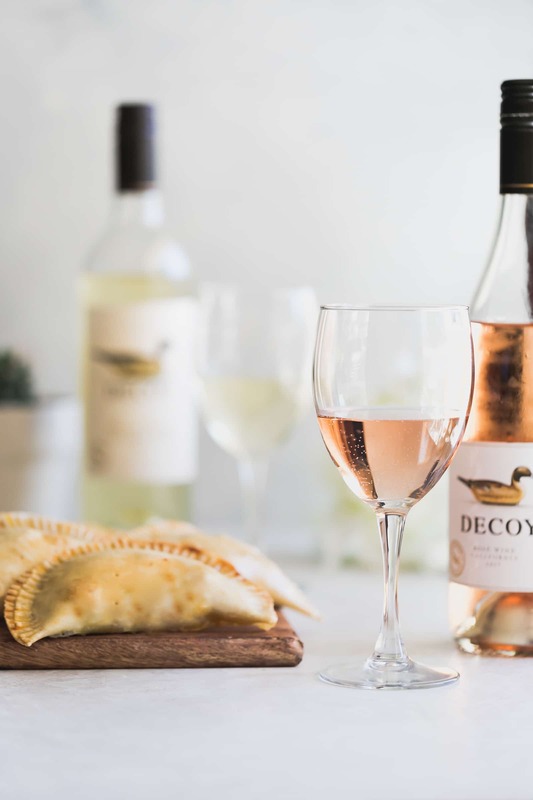 That’s why I’m so excited to be partnering with Decoy Wines to pair with these sweet savory empanadas! Ok let’s talk about these amazing flavors! First off – dates, bacon & brie. I mean HELLO…how good does that sound. Trust me, it tastes just as good as it sounds. You get the sweetness from the dates, the buttery taste from the brie and the salty sweet from the applewood bacon (that’s my go-to). It’s just a flavor explosion. The next one on the list – mushrooms, caramelized onions, & goat cheese. My three favorite things in one! I love mushrooms (as you’ve seen many times) and then caramelized onions with creamy goat cheese. YES PLEASE. These two are total wins in my book. And yes, I don’t care what anyone says, they can totally be considered a meal! 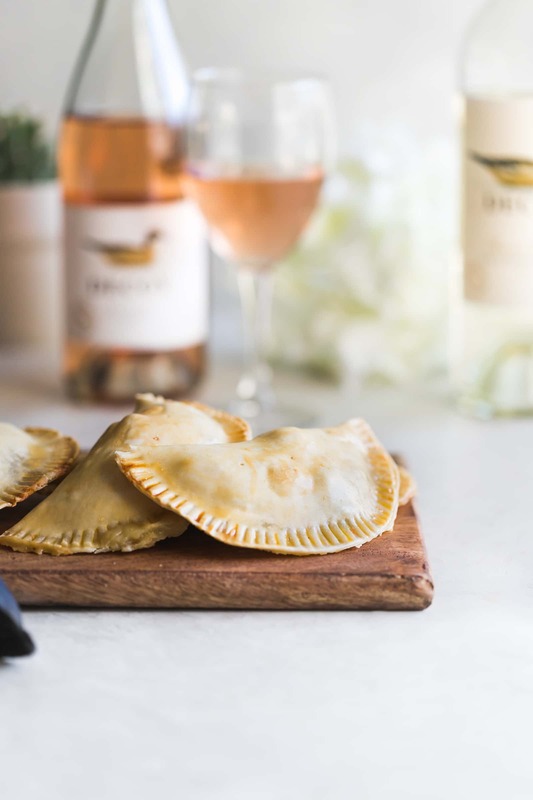 Not only are these sweet savory empanadas absolutely DELICIOUS, they also pair perfectly with these wines crafted from one of the finest American wine producers. The California Rosé has enticing aromas of pink grapefruit and fresh picked strawberries, along with hints of honeydew melon and raspberry. I’d personally pair this one with the dates, bacon, & brie empanada. This rosé has such a light, crisp, fruity flavor. The Sonoma County Sauvignon Blanc has vivid flavors of grapefruit and apricot, as well as lovely notes of honeydew and lemongrass. The mushroom, caramelized onions, & goat cheese empanadas would pair so well with this slightly sweet wine. It has such a refreshing taste! You can totally choose your own adventure and pair these wines with either one of the empanadas. Above all, just make sure you have them both on hand for your next dinner party. Your friends will be so impressed! I hope you make these and LOVE them! In a skillet, cook sliced onions under caramelized, about 20-30 minutes. Transfer to a plate. In the same skillet, heat the olive oil. Add mushrooms, cumin, salt and pepper. Cook until tender, about 10 minutes. Transfer to a plate. Preheat oven at 400 degrees F. Line a baking dish with parchment paper and spray with cooking spray. Set aside. In a pastry round, divide caramelized onions, mushrooms, and goat cheese evenly into the center of the circle, fold, and seal with a fork. Do the same with chopped bacon, brie, and dates. Fill, fold, and seal with a fork. Repeat with remaining ingredients until you have 20 empanadas (10 for each). Looking for sauces for the empanadas? You can use balsamic glaze, cilantro garlic sauce, or avocado chimichurri. Find Decoy Wines in your area by clicking here.